Images are one of the main visual elements used in Graphic Design,but what images should be used? Is it best to invest in exclusive images or the best cost/benefit solution is to use stock photography? Arguably, the biggest benefit of creating you own images (and conversely, the biggest problem of using stock photography) is exclusivity. A stock image can be used by anyone on any project. There is a real risk of your competitor using the same image, but the problems can be bigger than that: all the imagery used alongside a logo will end up becoming part of that brand. Look closely and you will see, for example, that all images used by Coca Cola tend to follow the same visual style. When you use a ‘ready made’ image, you are taking the risk of using an image that is already linked to different ‘values’, often different to those you want it to convey to your audience. Maybe one of the biggest advantages of producing you own image is that you can make it look exactly how it should. When you use a stock image, this is not always possible. This adaptability helps preventing external factors to limit creativity. Furthermore, being able to control all the composition elements give the designer much more power, leading to a better result. Produce your own photographs, or hire a professional photographer aren’t always options that will fit the budget. But remember: photography is not the only source of images. Typography, when used wisely, can act as a textual element or as an image, and this could be one of the best and quickest alternative when creating without using ready made images. Handwritten text, using alternative techniques, can help creating a differential. The ad below is for one of the biggest Brazilian dairy companies, Batavo, and although it uses some photography, the main element was hand made, and delivers the intended message. 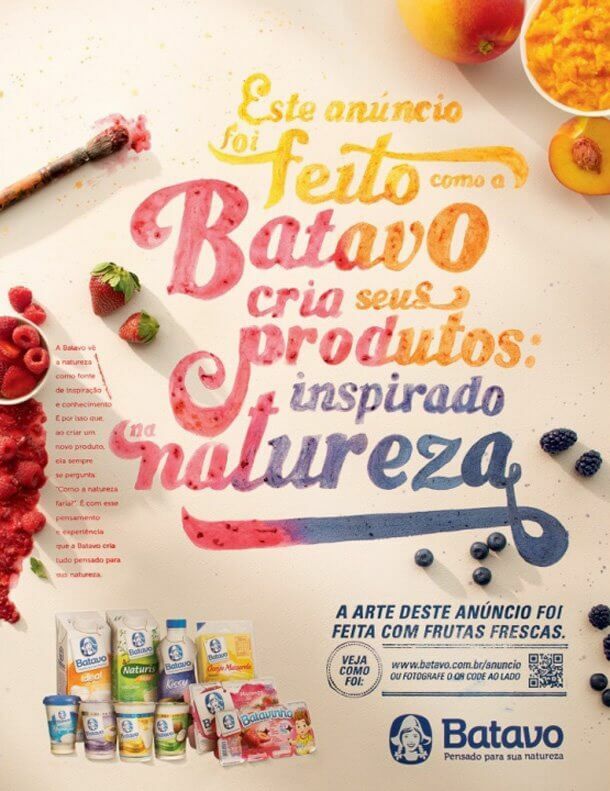 The main text says: “This ad was produced the way Batavo creates it’s products: inspired by nature”. And the subtitle: “The art for this advert was produced using fresh fruit”. Typography is not the only way to achieve these results, abstracts elements can also be an option. Of course, this approach might not be adequate to every project, but it sometimes can be a good alternative. It might be risky as not every designer have the required skills for a good result. And an abstract image will require a different interpretation from it’s audience. We all know the saying. Creating your own images will require more time than searching for a ready made photo. The key is to achieve the balance between investing more time (and money) when the project requires a better and more differentiated result.